And the living is ... hot. Due to a variety of unforeseen (and unfortunate) circumstances, we've been in New York all summer. No Maine for us. Sigh. We've spent most mornings at the playground enjoying the sprinklers. Well, the girls have enjoyed them, while I've sat on various benches knitting up sleeves (conveniently small enough to fit in my purse). And in the afternoon during Penelope's naptime in the air conditioning, Isobel and I have watched movies, read books, and knit sweater bodies. 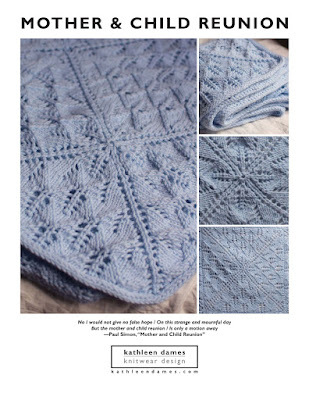 I've been working on a Knitty submission and a pattern to be self-published once Jane Austen Knits comes out. Sadly, both are not ready for their close-ups (and Knitty gets upset if you show things pre-publication). Guess who is ready for her close-up? I've also worked a version of my Night Watch Cap pattern in Rowan Calmer that, hopefully, will make a good chemo cap for a friend's sister. Penelope modeled it for me at the aforementioned playground. That Calmer is an interesting yarn - very squishy and stretchy. Perfect for a chemo cap, since it's soft and machine-washable. Makes a great ribbed hat. So, we're off to Boston this weekend. Isobel will get to spend some time with my ex and some of his extended family. I will get to at least one North Shore beach and hit up the Fiber Revival on Saturday. And we may tour Fenway Park on Sunday morning - what else are you going to do when the Sox are on a road trip? There will also be a burger and shake taste-off at Mr. Bartley's (we'll compare to our Friday Family Date spot, Mel's Burger Bar). I'm on the second sleeve of both sweaters so hope to finish at least one (if not both) of them before we go. I always like to start a new project when I hit the road - less anxiety about having nothing to do that way. I mean, what if I finished a project on the way UP there? What a disaster that would be!